Wayforward contacted me for urgent help with the in game interface design for the Nintendo DS game Contra 4. The style they were looking for was a combination of futuristic/alien inspired graphic design. The work was focused on the main lobby interface but I also created the tracker interface that appears on one of the dual DS screens. The images show some of the interface concepts and screenshots from the final game. Ugh, I've been trying to work on a steampunk web design for a while now, and it's just awful. This however, is amazing. How the hell do you do this?! It's soooo good. Keep up the amazing work! I drooled a bit. It's busy but that doesn't seem to distract from the interface at all. Top notch! karsten you son of odin,thats exceptional work man. I JUST CAME ALL OVER EVERYTHING +FAV!!!!!!! 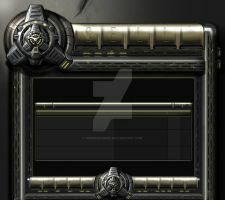 The interface was actually intial made for "flashlevel", but since the owner got jailed (for selling warez online,) they was not able to hire me anylonger and buy the final artwork. So then Wayforward bought the rights for it. Im not sure what happend to flashlevel, and if the owner is till jailed.. Pretty horrifically frightening....why aren't they still using it as their template? hehe, it's used in the game Contra5 for Nintendo DS. Oh I see; I think my brother has that game. Thanks, you can see it live in the game Contra 4 for Nintendo DS. wow... did u paint it? Very techy and damn great detail level! this is the best interface i ever saw!!!!!!!!! did u use 3d program or its photoshop?!?!? wow. simply wow. you can tell the amount of work put it by looking at the detail. ya to be honest i put a little to much time into this design.. This is the best motherfuckin design i'd ever seen. HOLY uber flipping crap thats so damn awesome!!!!!!!!!!!!! oh my god thats amazing. your work is so good, i am trying to learn this style so ive signed up to the newsletter and look forward to recieving some awesome tutorials. This is fine work. Jolly good.